Curaçao Encourages Americans to Say, "No to Snow!" Ten hotels in Curaçao extend travel deals to escape the cold in exchange for the Caribbean. “We know how tough it is to get through these winter months,” says Curaçao Tourist Board Marketing Manager, North America, André Rojer. The Southern Caribbean island of Curaçao is helping Americans flee the icy winter months by providing deeply discounted offers. Vacationers tired of dreary days and shivery nights can more easily afford to luxuriate under warm, sunny skies for a few days in beautiful, colorful Curaçao with these discounts. Blue Bay Curaçao Golf & Beach Resort - Stay 4 Nights, Pay for 3. 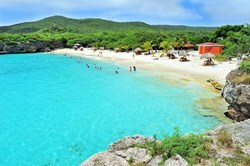 Contact: hotelreservations(at)bluebay-curacao(dot)com / http://www.bluebay-curacao.com. Curaçao Marriott Beach Resort & Emerald Casino offers a 15% discount on the best available rate. Book at http://www.marriott.com/curmc or call 1-800-228-9290. Request promotion code W21. Selected as one of The Top 5 Cities in the Caribbean in the 2013 Conde Nast Traveler Readers’ Survey, one of The 10 Best Caribbean Snorkeling Spots’ for 2013 by Frommers, Favorite Caribbean Destination’ for 2012 and 2013 in About.com Reader’s Choice Awards and a ‘2012 Honeymoon Hot Spot’ by Condé Nast Traveler, Curaçao is a unique Caribbean island paradise, boasting 35 uncrowded beaches, and an eclectic mix of history and culture. Explore the vibrant, culturally diverse capital city of Willemstad – a UNESCO World Heritage site – with its distinctive architecture, museums, monuments and world-class shopping. Indulge in Curaçao’s vast selection of flavorful restaurants, with a mix of sophisticated international and tasty local cuisines. Discover Curaçao’s abundant natural beauty, pristine dive sites and spectacular snorkeling at secluded beaches. Curaçao offers idyllic weather, situated on the outer fringes of the Hurricane Belt.